Absorbing your members into the community is an important task. First impressions always last and you want to make sure that each member gets the right treatment from the get go. BUT, as a community manager you don't always have the time to reach every single member. That's where Membership Emails come in to play. You have an automated email for each step of your member onboarding. We have created templates to make it a little easier for you, though you can edit them and change them as you wish to give it the feel of your community. Here are the Emails in our suggested sequence, you can also turn each one on and off to suit your needs. First, ask yourself how you are inviting members to come on board. 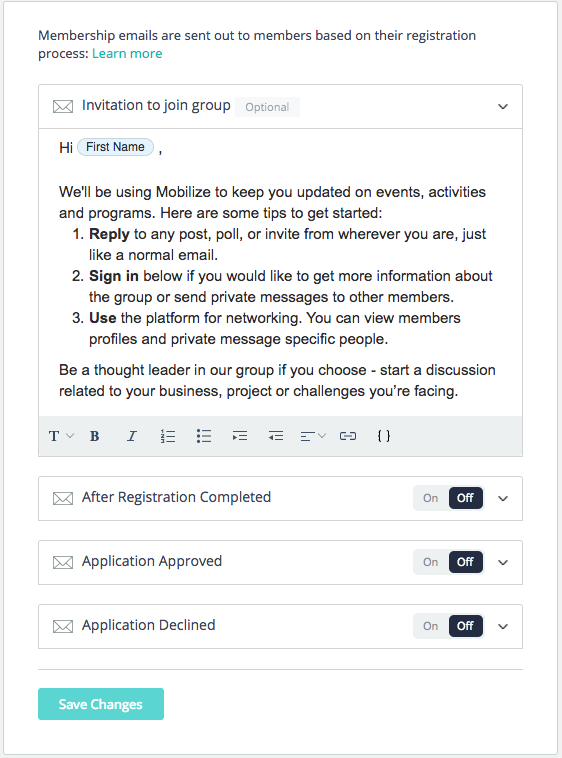 You can set an "Invitation to join the group" email that would reach the member you added automatically as soon as you add them to the community. You can modify the text, add merge tags to make it more personal and any links you want to share with them. TIP: This is a great email to give your member all the information they need to stay in touch with the community and stay updated. 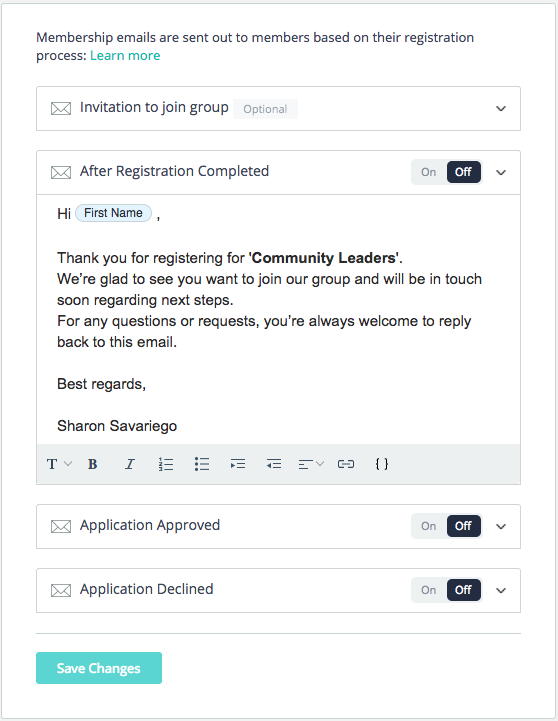 If you're inviting your members to sign up to your community via a registration form then you would want them to get a notification that they successfully registered. There are two options here, based on whether the group requires or does not require manager approval to join. If getting into the group requires manager approval, then the act of registering is only a registration, not approval yet to actually join. In this case, "After Registration Complete" email will be sent as soon as the member clicks "submit" on the registration form. Make sure to turn it On to make it active. You can go in and modify it at any time. Remember, if your community is approval based (meaning that checked the "Joining the group requires manager's approval" checkbox in the Permissions tab in your group settings area) then you are manually approving members in to the community. This is where the "Application Approved" email comes in to play. This email will be automatically sent to members whom you manually approve into the group. This is your opportunity to give some important info about the group to your member. This template has all the unique links you need to provide your member so that they can follow and engage with the group the way that they choose. You can modify and change this email as you like. The final membership email is the "Application Declined" email. 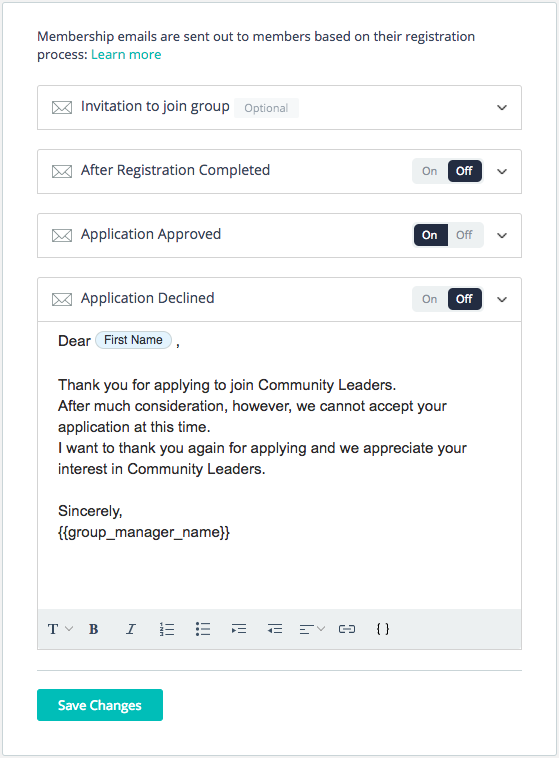 In case you choose NOT to approve a member in to the community, and you manually Decline them, this email will be automatically sent to them informing them that their application was not accepted at this time. Let's return to the original case of #2, where your members can join via a registration form. This can even be if a member joins a Suggested Group within the community. If joining the group doesn't require approval, and the member fills out the form to join, they are approved automatically. In that case, they will get the Application Approved email. In other words, that Application Approved membership email template goes out whether the member was approved automatically or manually. 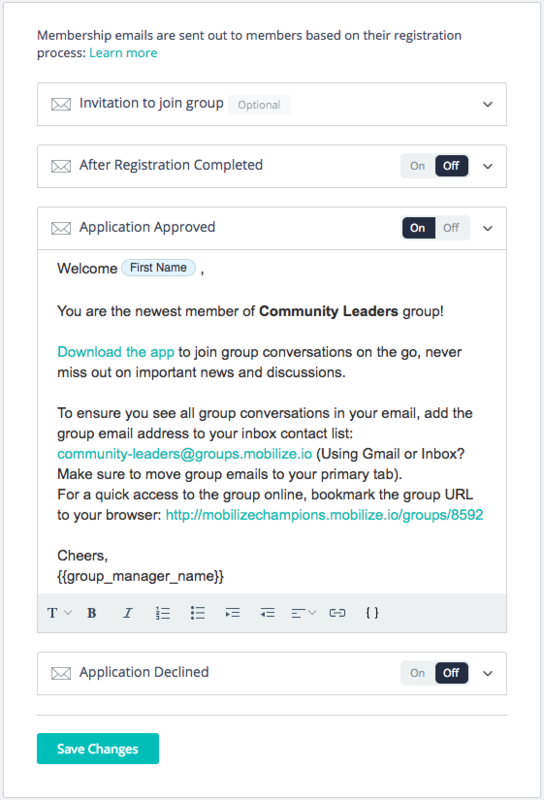 If you have a few optional groups for existing members to join (set to Closed and doesn't require approval), you may want to keep those Application Approved emails shorter because the member will already understand that they're part of this community. For example, quick reminder of the purpose of that subgroup and the group email alias can suffice.